I’d like to share with you a request I received recently. I receive these almost weekly. My wife and I are looking for some good hot sauce. We have tried lots of hot sauces locally. But are still not satisfied. We want to try them all! So we are at the point of looking online/nationally to see if we can find some good hot sauce. If you could please send us out some samples to try. If we love it, we will def buy online or from a local store (if possible) you can be assured because we are hot sauce freaks! Please do not respond we don’t send samples but you can buy our products at XYZ. We are aware we can buy your sauce online but don’t want to waste tons of money if we don’t like it. Now, you can probably see the dilemma for us here. After six years running our business, we have come to realize that a certain group of people will always treat you the same. They come with a hand out asking for free samples to do a review of the product and promising to post about it and talk it up to their massive following of 100 Instagram followers or YouTube channel. If we gave into every request, we wouldn’t have any product to sell and make a simple living with. Sometimes they even want them shipped to other countries. Postage to those countries costs a small fortune! As a family working together, building a business that supports us and gives back to our community is what we love doing. We mostly donate to non-profit community and school/learning based programs. However, if we can’t support ourselves, we can’t support others. I’ve even found that there are forums of people trading information on what companies out there will give out free products! Yes, I feel reviews of products are very valuable, but only if they are true unbiased reviews that haven’t been influenced one way or the other. This practice of asking for freebies is so rampant that Amazon.com recently banned incentivized reviews tied to free or discounted products and started suing them. Reviews of free products ultimately hurt both the business and the consumer, as a way to work around bans on paying for reviews directly. Many who wrote these reviews gained reputations for consistently posting positive ratings and comments, thereby making sure they’d receive more free products. Prior to launching Adoboloco with my family, I had been a professional graphic designer for 20 years, doing work for clients all over the world. I became a designer just as the computer was becoming a major tool in the industry. I learned to do my craft based on the old methods and the new emerging methods of going digital. I love to design and create and I worked hard at it. Over my career, I started to see a disturbing trend emerge that basically asked designers to work on spec, or for free. The way it worked was this: you design a logo for our company and we’ll review all the submissions and choose the best one. If yours is chosen, we’ll give you a lifetime supply of our product or MAYBE pay you. Well, the saying is true, “You get what you pay for.” You’d never be able to get 5 restaurants to deliver finished meals to your home, say you’re going to review the meals and the best one will receive a glowing review on Yelp or that you’d offer them a lifetime of good comments to others about their restaurant IF they were selected as the best. What’s funny/not funny is I had a few clients try these services and then come back to us pleading to fix the situation they’d gotten themselves into. 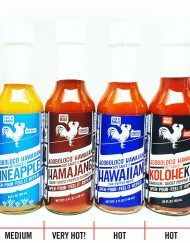 Thanks for your interest in Adoboloco Hawaiian Hot Sauce Co., our small family business. Before we send you your free samples, I propose that you come to work with me for the next month so that you can see what really goes into making hot sauce. You’ll get to breathe in the chili-laced vapors that most people can’t handle. You’ll get to experience burns on your arms, face and unmentionable parts of your body because you forgot your hands have been soaked in chili peppers for days. You’ll get to feel the heat and all that goes with it in the kitchen. While you’re here, we might as well put you to work. We’ll need you to move a few pallets, pour vinegar from large drums and carry a bunch of 45 lb boxes. You’ll also get to tend the smoker – to load it, unload it and by the end of the day you’ll smell like fresh cooked brisket. When you’re not in the kitchen you’ll be able to work in the fields, tilling rich animal manure into the dirt. You’ll also get to pick thousands and thousands of tiny chili peppers by hand. If we’re happy with your work ethic, we’ll consider giving you a case of sauce, your choice. But before that happens we’re going to get 4 others to do the same, only one of you will receive that case of sauce. Sound like a fair trade? We work hard creating a high-quality product. We love what we do and love providing joy to our fans and customers. Please don’t try to take advantage of us or any other company working hard to run a business… it isn’t easy.